The role of the IT leader is evolving once again in 2017 as we navigate the ever-shifting sands of emerging technologies, business trends, and human demands. As we dive into the new year, let’s take a look at what trends we can expect to drive IT purchasing decisions and what workers want from IT in 2017. IT in 2017 is about simplification. Employees don’t want to be wowed with fancy gadgets and they’re tired of having to create new passwords and logins; they simply want their lives to be made easier, so they can focus on the task in hand. So help them out with tech that speaks to the platforms they already use, that’s intuitive and has proven high adoption rates, and that they can use on the device of their choice. Focus on solutions that reduce admin time and enable employees to work from anywhere. With 81% of workers spending less than 40 hours per week at their desks, near and far business travel should be a high priority for IT teams to tackle in 2017. Whether it’s traveling to the other side of town for a client meeting, or halfway around the world for a conference, keeping employees connected and at optimum productivity is essential. As the power of cloud computing continues to rise, what we’ll see in 2017 is more and more businesses making the jump to a pure-cloud model that includes their communication as well as productivity. Pure-cloud solutions are the key to enabling your anywhere workers, wherever they are, with the only necessity being an internet connection and the device of their choice. There is good news for our pockets in 2017. The cloud brings with it simplified pricing structures and tailored solutions that easily scale up and down to suit each business. There is also a reduced need for hardware, which in some cases can be eliminated altogether. For example, companies killing the desk phone and moving to a pure-cloud communication solution can expect to make 60% savings on telephony costs, leaving cash that is better spent elsewhere in the business. Today, no tech solution is complete without a sophisticated analytics accompaniment, enabling IT teams to prove adoption rates and assess the impact on the bottom line. Ultimately, we have more control over and insight into IT spend. There is simply no room for legacy systems in 2017 that can’t offer the same cost savings and understanding, and this is the biggest push factor for updating tech stacks this year. People want to live life to the fullest in 2017 and yes, this transcends into IT. With topics like health, wellness and work-life balance surging as part of the most popular new year’s resolutions, businesses must not think themselves above these trends but embrace new attitudes and help employees be the best they can be. For example, a found that happy employees can be up to 20% more productive than their unhappy colleagues. Let’s couple that with the finding that 83.5% of workers believe flexible working boosts their overall happiness and we’re left with an easy win for IT. With cloud communications now forming the last piece of the puzzle in the anywhere worker IT stack, we have the means to empower employees to be the master of their own success and work in the way that they are most productive. An employee-centric IT strategy is essential for success and IT leaders must connect with their workforces, simply ask them what they want, and share their goals in order to build and rejuvenate a tech stack that works. 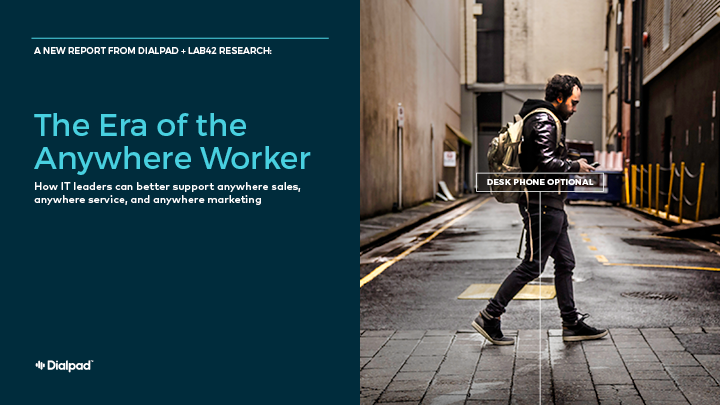 Drive happiness in your organization by building an Anywhere Workforce. Watch to learn how.